The memorial garden is situated on the western side of the Church facing Coromandel Parade. A low wall surrounds the inner part of the garden, the top surface of the wall capping provides the only area available for mounting small personal plaques. A plaque ordering form may be obtained from the Uniting Church Office. Ashes may be scattered in the garden if desired, privately or with your minister present. There is no provision for niches in the wall or for burying the urn or the ashes. Space may be reserved on the wall for a future plaque if a member of the family desires it. This arrangement may be made at the Church office when lodging the order form. A sample plaque is illustrated on the back of our Memorial Garden brochure (available from our church Office or see the link at bottom of this page). The order form, together with the fee (payable when lodging the order) will be accepted at the Church office. Cheques are payable to Blackwood Uniting Church. The cost of a five line plaque is $300. this includes the cost of manufacture, fixing to the wall and GST. Delivery time for the plaque is approximately six weeks. Click here to download a PDF brochure on our Memorial Garden. 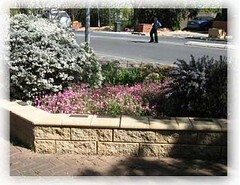 You are very welcome to come visit the Memorial Garden at Blackwood Uniting Church any time. If you would like more information, please contact the church Office.